Welcome to the Yurt! – Y is For Home! 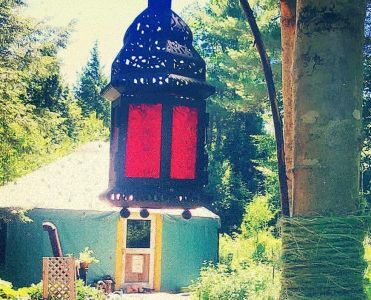 Yesterday, we celebrated 7 years of off-grid yurting! We put up our little house in 2010 as eager, idealistic newlyweds – and 7 years later, we’re still eager, idealistic newlyweds, we just have 2 kids, a dog, and plenty of experience thrown in! Looking back on our time getting to know our land, adjusting to small-house living, off-grid living, and parenthood, we realized that we have a lot to share! So here we are, ready to talk about yurts, off-grid living, homesteading, parenthood, minimalism, gardening, chickens, pigs, goats, tiny houses, homeschooling, and all the exciting day to day aspects of living close to nature! Whether you’ve got piles of advice to offer or you’d just like to sit back and learn a bit about how this lifestyle works for us, we’d love to see you join in the conversation! Welcome to our home.